If you’re interested in taking a doctorate, Germany offers flexible programmes tailored to individual needs, funding opportunities to finance your studies, and degrees that will make you highly competitive in today’s market. Join the growing number of international students pursuing doctoral studies in Germany, where English is the language of research and doctoral education is truly international. 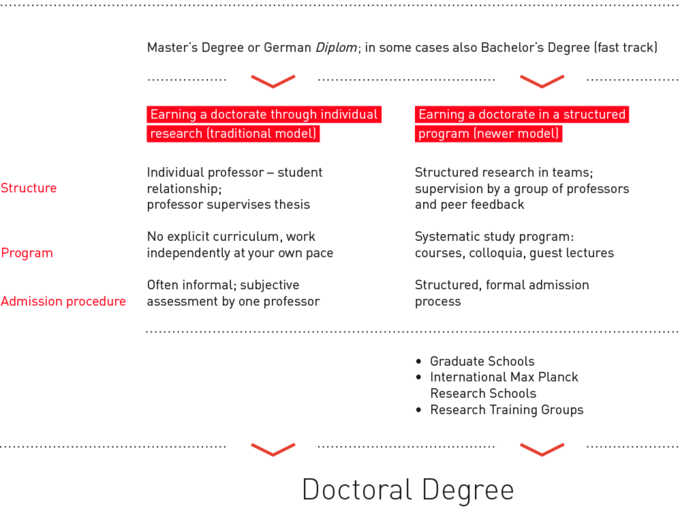 Whether you do your doctorate on a topic in your own field, supervised individually by a university professor, or complete a structured doctoral program, your German doctorate will enable you to compete with the best for positions in industry or academia. Whichever path you choose, there are no tuition fees and plenty of schemes to help you finance your studies. Many doctoral candidates work as research or teaching assistants for a university professor, and are paid a competitive salary. Various German research organizations and foundations provide funding for doctoral candidates. Doctoral candidates at International Max Planck Research Schools or in Research Training Groups can obtain grants for up to three years to finance their studies. Graduate Schools (Graduiertenschulen) fund doctoral candidates directly. There are two paths to a doctorate in Germany: the individual supervised doctorate or the doctorate in a graduation program. The visualisation of the two possibilities below provides more detailed information. Please note that www.doctoral-programs.de provides information only on doctoral programs in the region of Berlin. For more information on an individually supervised doctorate, please contact potential departments, chairs and working groups of the relevant universities.